When does the path open? Every day from Tuesday to Sunday. Entry permits are 10 Euros per person, 18 for the guided tour and 11,55 for the entry and shuttle bus…Payment is made by credit/bank card in full during the booking process. In the the top left column click on “Book your visit” and you’ll be taken to the booking portal (In Spanish) You can select English language at the top right of the booking portal. Click on “Comprar – Purchase” and the page refreshes with an area at the bottom for you to fill out your details. Click on” Finalizar” and enter your card details and click “Pagar”. You will receive an email with confirmation of your entry…PRINT THIS and take it with you along with your passport AND the credit card that you used to make the purchase on the day of your walk. Note: Try to get all your info right the first time. Sometimes when the page refreshes and you have got something wrong, the information you previously entered is lost and you have to start again. Some people are having trouble with the system accepting emails. If this happens try a different email address. If you can’t get a ticket for the day you want then the one alternative is to stay in a local hotel. These are the ones nearest to the Caminito del Rey. Previous PostIn one hour drive, really beautifulNext PostA rare picture of the boss climbing ️ this is Mel crushing it in the sunshine …. That about rules now for climbers access? Last year it was writen rule to let in free climbers who has civil liability insurance. Thats heard for this year? Can anyone tell me if I can book for October? The website looks to only go to September?? As of now bookings are up to September….. They will open up for autumn season nearer to October, maybe in late August or earlt september… Just keep an eye on the website…. Hi Anita…. The starting point for the walk is from the lakes, kings chair, el kiosko restaurant side and not the village of El Chorro. one way foot traffic also means that you will need to get the bus back to your starting point and car… Buses run every half hour or so. Hi Sarah, not sure how you booked so many people as I saw that there was a limit of 4 people along with the person buying the tickets (making a total of 5 people) or, did you do the process 3 times? I have booked tickets for 2 people on the 21st may. We are staying in Malaga and am not sure on the best way to get to the start of the walk. The time we have booked is 1200. Any help would be fantastic! Hi John…. getting to El Chorro here.. Remember that the access is from the lake/el kiosko/bar mirador side and finishes at El Chorro where you can get a bus (every half hour) back to your car. Have all the dates now been booked up as the website only seems to show Friday 22nd April 2016 – or are they just releasing a few dates at a time? Is there any posibility to get tickets for apríl 30 or may 1 when in the online systém is writen:”agotado”? Ela, “Agotado” run out, empty…. Means all tickets are gone for that date and time… Another option is to stay in a local hotel such as these and see if they can arrange the permits for you. The website did not like my E U or USA passport number and I do not know what Tif, one of the requirws blanks, means. The “Tif” blank was the problem. Finally figured out it was for ” Telefono”. We had a beautiful day for our walk on April 27 and thought El Caminito was truly spectacular! If we had not had the restaurant El Mirador as an end point, we might have had a bit more of a problem finding the start. So thanks for all the helpful hints! Thank you for such detailed and informative guide on how to book the Camihito tickets. May I check if you know when the dates for Sept/Oct is going to be released? I followed your instructions for booking and it seems that the date are only opened till 30th June. Thanks in advance for your kind help! Maybe they have changed the site, but the larger image of the four is on the top right, not top left. Am I correct in thinking the top right image is now the image I should use for a member of the public booking? Really appreciate the information provided. I was able to purchase 2 tickets for June 24 2016 but it only required me to enter one name and one passport number – will that be a problem? I read that names and passport details are required for all ticket holders. If so is there a website to enter the second person’s details. The earliest time I got tickets for was 1500 hours – is there anything we need for that hour of the day from heat or if it gets dark? Also I heard it is safer now to do the walk. Is safety equipment provided and is there help along the way? We have never climbed mountains etc but are comfortable walking 10km +. Hi Rajeev, I try to keep the info here as up to date as possible but I would appreciate it if you would let me know when you go how it went re checking in etc… The system has changed again and it seems that just 1 person gets the permits for all people going. Still, it is best for people to carry their id with them at all times anyway just in case. You should have yours and maybe even the card that you used to pay with. Dark won’t be a problem but make sure you have a hat and suncream plus plenty of water for everybody. The walk is completely safe and you will be supplied with hard hats for the walk when you enter. After buying a ticket ( following your instructions, god bless you 😉 ) i finally got to the print a ticket part. Something went wrong and i didn’t take a picture or saved it but money from my account was taken. Will I receive any confirmation email or do you maybe have their contact number? I plan to visit the caminitio in august. My plan is to stay overnight at the camping in El Chorro and will take the bus in the morning to the entrance. I found a plan for the busses. I noticed that the earliest bus left El Chorro at 8.45 in the morning in direction north. Is this right? How long will the bus drive north to the destination at the Kiosk where my walk to the entrance starts? And is it early enough to reach in time the entrance at 9.30 ( 30 min before 10.00) for the first start to the caminito? I have my own helmet. Is it allowed to use this or do I have to use this from the organisation? You would be better staying at the Ardales/lakeside camping as this would also remove the need for a bus to get to the start point as it is just 20 minutes walk away from the checkpoint. I would like to go CAMINITO DEL REY on 22-May 2016.But I saw all the tickets already sold out. If I want to try my luck to book those last minutes ticket( with (ag), (es) and (co) ), what is the different between those ticket? BTW I will stay in a hotel in Malaga for one night only, they can’t help me to book the ticket on 22-MAY 2016. If I fail to book the last minute ticket, is there any other method to go inside?Thank you. Hi Sunny, I think you will have to rely on one of the last minute (2 or 3 days in advance) links and hope for the best. The ticketing system is very confusing for people, even native Spanish speakers. Bets of luck and let me know how you get on…. Where is the best place to park an auto? Thanks for the response! I just went back on the site and got tickets for my day! (21 Jun) There are hundreds available now. Thanks again for the help! I want to buy 5 tickets. The system says “unvalid email” but the email is right. What can I do? Hi, other people have had this issue… Can you try a different email address? Clive, this website is a terrific help and prepared me for the difficulties of using the online booking. The email problem that people have may be because the last box to be filled in, bottom right, asks you to repeat some information. Because that box was under the passport number box I put in my passport number. Wrong: it is for you to repeat your email address. Hi Simon, thanks for your kind comments and the helpfull info about the email confirm box. Hello, nearly booked tickets but for some reason it is not accepting our e-mail addresses. Has this happened to anyone else? Any ideas? Yes, some people are having a similar problem with the email… Can you try a different email address? CAMINITO DEL REY (AG.) CAMINITO DEL REY (ES.) and CAMINITO DEL REY (CO.). What is the difference and what do I have to choose as a private person? I’ve promised you to give you some feedback after visting Caminito del Rey. I booked my four tickets on the 22nd of April on the website and it worked very well. We started our walking tour on the 18th of May at 12 o’clock from restaurante El Kiosko on the north side and it took us 3½ hours to reach the busstop in El Chorro. It was an amazing trip that I can recommend others to do. Beautiful landscape in this mountain area. In the future I would suggest a better logistic so that you don’t have to do so much queuing by the entrance and at the buss stop. It took us more than half en hour to board the bus. The bussdriver had to tear of the ticket from the boardingpass with a ruler from every passenger. He was not familiar with that. Some passengers paid for the tickets with cash. He got no small change, because of getting so many banknotes. The worst thing was the lack of toilets. This pulls down the overall experience, but we are all children at the beginning. Anyway I will recommend this walking tour to everyone. It was exciting and not so dangerous at all. Even for me who have problems with heights and vertigo. Many thanks for your good websites and comments, Clive! Just a quick question, is this starting point downhill? I’m reading that there is more than one but taking my parents so don’t want the uphill one! I had to book for 5:30pm as most time slots were take (13th July). Hoping it will be a bit cooler than the height of the afternoon. We have a car and just want to make sure we know where we are going, plan to see the lakes first since we have the morning free. How long will it take us to get to the starting point and how early do we need to get there? Some pointers would be great! Hi Lynne, you would arrive at El Chorro and then catch 1 of the buses that run every half hour or so to the start point. Then, walk back along the Caminito to El Chorro where you catch your train. Make sure you book your entry time to coincide with train times. hello, thanks for all your help its been very useful! One question, can you chose what side of the route your start? It isn’t specific to tickets? Thanks for a great service and help, my Spanish friend was struggling to use the website! What would be the options to return to Aldares if we miss the last bus? Thank you! Hi, I am sure that you would be able to call a taxi from 1 of the bars on the El Chorro side after you finish the walk. Thanks for the guidance. Some feedback from doing the walk today. Had to book the walk at the last moment which meant no way to print the tickets. The website is not good but with a bit of care it all seems to work. First problem on an iPad is that some of the pages are bigger than the screen. Things like language selection and the buttons to select your timeslot are only visible if you swipe in from the right. I had a problem with an ‘unvalid’ email address as well. This was my fault as the email confirmation box is right under the passport number box. I wasn’t reading properly and was trying to re-enter my passport number. All worked when I spotted this. As I couldn’t print the tickets, I took my phone along with a pdf image. This was fine as all they wanted to do at the kiosk was scan the QR code on the ticket. FOR US, no other ID was requested. Just make sure you have an offline copy of the pdf as you can’t download it when you arrive if there’s no phone signal. You must start the walk at the north end. Trying to find this on a map is not easy as the ‘entrance’ kiosk is 15 minutes walk from the road. For us ‘Caminito del rey acceso norte’ is findable in Google Maps. Just drive there. It’s really obvious when you arrive and plenty of parking nearby. Finally, despite a previous comment, we found toilets at both ends. Thanks Andy, that extra info will help others a lot…. When will be avaliale tickets for oktober? Hi, I trvale with my husband to Malaga and when we checked ticket during weekend, everything was sold out. We found last tickets for guided tour on July 31st, so we booked guided tour. Now I checked and there are plenty free ticket for regular tour and also for other dates. Is it possible to cancel and book regular tour? If not, I have one more question, we have time 12:45 and seems for us good as there is train to El chorro from Malaga at 10:05. But now I read that shuttle bus starts at 12:30?!!!! How can we get to El Kiosko from El Chorro? (We are not going to book accommodation there). Thank you. is passport necessary for entrance into Caminito or is ID card enough? We have several tickets, that I bought with my passport, but one of the ticket owners does not have a passport. We are EU citizens. Thank you. what a helpful website – I was totally confused when I tried out the website that gives the option for English then doesn’t use English. Hi Suzanne, I am sorry to be so late in Replying to you…. Renfe have just introduced a new daily service between Malaga and both El Chorro and Ronda. but its not much help I am afraid. The train departs Málaga MZ station at 10.05, stops at Álora at 10.30 and arrives at El Chorro at 10.43 and Ronda at 11.52. The return train leaves Ronda at 16.55, leaves El Chorro at 18.02 arriving in Álora at 18.15 and Málaga MZ at 18.47.
we have 2 additional ticket avaliable for date October 15, 2016 – 13,30 pm, entry + bus, total price 11,55 eur each. Is it possible to return the tickets or is there anyone interested in buying them? You will have to contact them directly and ask what the procedure is, I presume you had an email with the permits to the Caminito del Rey? As far as I know tickets are not transferable as you booked in your name and I doubt if there is a refund available. I have the same problem…3 extra tickets…November 4th 12.30…anyone want them? I have a few questions and thank you in advance for your help. We will be driving from Nerja, so what town do I put in the navigation? I can’t tell if I am supposed to park in El Chorro and take a bus from there, or drive to the other town? Also is there a better time of day for hiking it? We will be there on November 11th. I’m hoping it won’t be intensely hot…..also wondered it there is a better time for taking photos there? Please share http://www.cxaminodelrey.es with your friends and family. Thanks! Also one more question. It says in November it is open from 10:00-2:00. Does that mean everyone has to be out by 2 or is that the last time someone can enter? How long does it take to walk once you are on the actual path? Hello, I am visiting from the UK and have just bought 2 tickets for 10.30 on Sunday (15th Jan). We shall be driving to El Chorro, can you please confirm where we need to go and what time we need to be there? I’ve managed to successfully book myself a ticket for the Caminito Del Rey for March – yay! I’ll be using public transport to get there and can see that the best way from Malaga is by train arriving at El Chorro. I’m just not clear on where to go once I arrive at El Chorro as from earlier posts I have read that this is where the walk ends. I have booked the bus along with my ticket, so can you tell me if I can get the bus from the train station or thereabouts in El Chorro to the start point at Kings Chair/El Kiosko Bar/Lakesides? Also I presume that the self service ticket machines are located at Kings Chair? Hi Gayle…. The bus timetable are here… (scroll to the bit that says horarios de invierno (winter hours)) http://static.sopde.es/malaga/subidas/archivos/7/6/arc_255167_v2.pdf …You should be able to get off the train at el chorro and get a bus fairly quickly to the lakeside where you will start your walk…. Thanks, I’ll take a look at the link. When booking my ticket through the website, on the page where you enter your name it tells you to collect tickets from the self service machine using the debit card used for the purchase. I’ve printed my ticket now so I suspect I’m sorted, saves me wasting time looking for a machine!!! I’m aiming to do the walk in February (looking like 16th) and want to do the longer walk at the start which I think is from King’s Chair. I’ll be driving there from Estepona – where should I be aiming for to park please? Also am I right in thinking the time I pick to book is for the entry to the “boardwalk” section and I therefore need to work back from that 50 mins to 1 hour plus to work out my park up time/walk start time which I see from one of the websites is 50 mins approx from King’s Chair? Thank you Clive – since my post I’d booked for 16th Feb and am looking forward to it! Hello! I’m planning a visit for mid April, but the regular tickets are sold out, and there seems to be some availability for guided tours. Do you know if these are offered in English? Thanks! Hi Clive, I’ve booked us on a tour as well as that was my only option to get a time. Can you tell me where the tour meets? At the start of the walk near El Kiosko, or at the checkpoint? My main concern with the first option is that it seems a little late in the day to begin a walk that takes 3-4hrs? Would we still be ok to visit that late? Will it be rushed? P.s. As an additional question, if we buy the 4pm tickets, is there a possibility of us being allowed in earlier if we are there and they haven’t got the full group for that particular time slot? They will probably restrict you to your reserved entry time so just get your tickets and stick to the plan….. Thank you for your advice. I did book the tickets straight away in the end rather than risking the time slot going and I’m glad I did. We had enough time to get around. We like to take our time and were lucky as they actually allowed us to start at 3.30pm as we were half hour early. It was a beautiful day! Thanks again for your very helpful website and feedback! We have reserved 12:30 and will come by train from Malaga (10:47),we bought also bustickets and thought we can go by bus to the north. Is it not so, do we have any possibilities getting there? Hi – we have a reservation for May 10 (2 days from now). Per the instructions above, we have the printed email of our reservation, and the credit card we used to purchase it (and our passports of course). But we don’t have printed tickets (it was never clear that we needed them – we just followed the instructions to bring the emailed reservation). We don’t have an easy way to print tickets now. Is the email of the reservation sufficient? Thanks. Hi… I think you will be fine with the email as the reservation has a number on the email that they can track….. Make sure you have the email available (Saved) on your mobile…. Remember that there might not be mobile cover! Thanks Clive. We ended up finding the link to download pdfs of the tickets onto our phone, so that worked fine. There was a url in the email we got with our reservation – we went to that link, entered our names, and got the pdfs of the tickets. That pdf also had the bus tickets on it. The ticket collector for the bus didn’t have a scanner, but she just looked at the tickets on our phone and let us on. I think it’d be great if the instructions said that printing the tickets or saving them as a pdf is a step that you need to do before leave home. We thought all you needed to do was to have the email with the reservation. Thanks for running this blog – it’s been super helpful! Thanks Clive – I guess we misunderstood that to mean “print the confirmation email that you get”. We had to do the separate step I mentioned above (by going to the site referenced in the confirmation email and entering our names next to each ticket) to get the actual tickets with the barcode. Anyway, it all worked out, and we loved the hike! Definitely worth the effort. Thanks again! Is there any left luggage place in El Chorro (maybe at the train station or at any hotel)? Me and my friend want to visit El Caminito being in transit, from Malaga to Sevilla, and we have some plane cabin baggage with us. Thanks Clive! You are doing a great job with this site! Hello – will be visiting the week of July 24 and be driving in from Villanueva del Rosario. So, I suppose we have the option to go to the northern entrance by the kings chair/el kiosko bar/lakesides or to El Chorro. I’m looking at the guided tour at 10:00 am (all general admin time slots for the morning are gone all week). Would you recommend parking at the Kiosko bar or El Chorro? And, do I have to make bus arrangements in advance? Many thanks. Hi, I bought tickets yesterday for August, on my booking confirmation it says CAMINITO DEL REY (WEB)EE is this correct, have I booked the right tickets?? I presume that you bought the tickets from the official website? Where did you buy the tickets from? Hi. We are hoping to book a guided visit for the end of June. Are the guided tours available in English do you know? I believe that some of the guides speak English but not all of them. Depends on who you get for the tour. This was very helpful! Just quick question, are Mondays usually available for hiking? I can’t seem to select any of them on their website? If we book the 10.05 train from Malaga, what time should we book to start the walk? Do we get off the train and start walking or catch the bus to the start when we get off the train? I’d like to buy 3 tickets to visit Caminito del Rey. The problem is I don’t have a good credit card. The cards ,what I have ,polish visa card and dutch maestro,is not able to finish transaction of payment. Is there any posibility to pay online or maybe to make a transfer with description or nr of transaction? We are going to visit Costa del Sol August this year, that’s why I was trying to buy tickets. I am afraid the worst,that all the tickets can be sold before we go on vacation. Are you able to sell me 3 tickets please.It,s about 06/08/2017 13-00. Maybe you could find someone (a friend) who does have a working card? Thats the only way you can pay online at the official website… I don’t sell tickets from this website…. 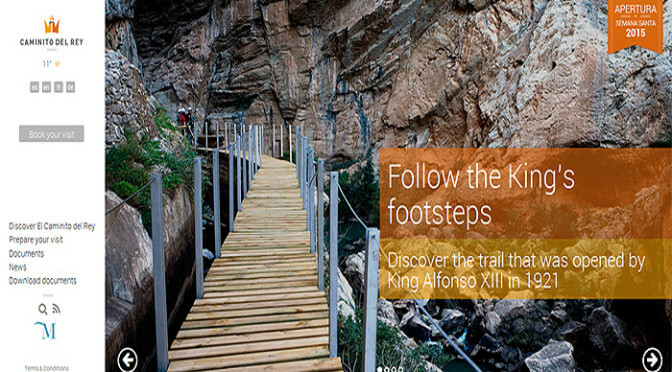 We would like to make a booking for the Caminito del Rey, but the only bookings still available include a guided tour. Are tours conducted in English or only in Spanish? Hello, I would like to buy tickets for September 10, 2019. Do you know when there would be available for purchase. Would you recommend a guided tour? We can’t print our tickets. Will showing them on our phone do?? People have commented that the email that gets sent to you is ok if its on your phone…..
Hello =) we want to visit caminitio del rey on the 14.08 at 11:30 and our Train stop at El Chorro at 10:50. It´s to late for the trip 11:30 or? So which time we should be at El Chorro latest to pass the entrance at 11:30? That wont get you to the start point in time for 11:30….. Remember that when you get off the train you then have to catch the shuttle bus (there is one every 30 minutes) to take you to the area where you then walk for 20 minutes to get to the startpoint of the Caminito del Rey…. Firstly, can I say a huge thank you for providing such a fabulous platform of advice on the Caminito. I spent hours trolling through various websites and happened upon yours by accident and it has virtually answered all my questions and enabled me to book our tickets on line with confidence. It’s so nice to know that I’m not the only one struggling to navigate around all the logistics and the ticket booking website – was really starting to despair!! We were only able to book tickets with a guide for later this month but figure we will probably just not bother with the guide when we get there, especially if there’s not much in English. We will be catching the 10.05am train from Malaga and have secured tickets for 12.45pm (which was the only time available). I understand the bus from the station leaves every half hour and then it’s a 20 minute walk to the entrance but can you please let me know how long the bus takes. Also, do you still need to get a bus back to the station at the end, or is that not necessary? There are only two return trains to Malaga – 3.13pm and 6.03pm so I’m just trying to get an idea how long this will all take without rushing and if catching the 3.13pm train back is realistic. Thanks so much for your prompt reply Clive – I feel so much more prepared for the day now, which I’ve been looking forward to for a long time! Hi Clive, I hope you can help me too. My husband is hoping to do the Caminito in January. The plan is that we both drive there, but he will do it alone. Instead of taking the bus back, he would like me to drive to El Chorro to pick him up. I am an excellent driver, however, I nearly died in a car accident on a mountain a few years ago and I am not at all comfortable driving IF there are huge drops by the roadside, also tight bends going down where you can see the bottom of the mountain in front of you. Can you tell me how is the road from El Kiosko to El Chorro? Thanks for any help you may give me. Even though the website showed SOLD OUT we took a chance and went on 11October without tickets. NOT a problem.! Hi Clive. I would like to add my thanks to your efforts here, most of my questions have been answered by reading the threads. One small question remains, the official website says that rucksacks are not allowed – is that really the case? Are we supposed to have carrier bags for the essentials? I booked tickets and paid, but tickets weren´t printed and I didn´t received e-mail with information about booking. I have only reservation nr. Is possible print tickets now? Or is possible have only reservation nr. for access? Hi, did you check your spam filter? People say that sometimes emails get treated as junk… Where did you get your reservation number from? The people at the gate are very helpful so if all you have is a reservation number and you explain what has happened i am sure that they will try to get you on the walkway…. I just purchased 6 tickets for June. I received confirmation of purchase with a confirmation number on it, but no tickets or bar codes. Is this all that is needed? Make sure you have your mobile with you so that you can show the people at the checkpoint what you recieved… All will be fine I am sure….